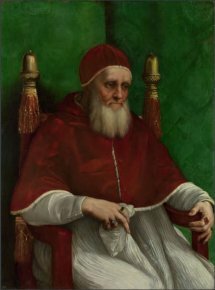 6/12/11 - Acquisition - Frankfurt, Städel Museum - A new version of the famous Portrait of Julius II (ill. 1) was acquired by the Städel Museum in Frankfurt and boldly presented as being by Raphael and his workshop. Two well-known versions, both attributed to Raphael, long fought for the label of original work, the one at the National Gallery in London (ill. 2) and that at the Uffizi in Florence (ill. 3). The English canvas was finally acknowledged as the work of the master himself. A copy can be found at the Palazzo Pitti, attributed to Titian by some art historians whereas a drawing of the head, in metalpoint, and attributed to Raphael’s workshop resides at Chatsworth. This recently discovered panel will be exhibited at the Städel Museum as of next 15 December. The first mention of the painting dates back to 29 March 1905 when it was in the Bercioux collection and came up for auction at Drouot in Paris. It passed on from one collector to another and was published by Arthur Dawson as a Raphael original, then ended up at an auction organized by Dorotheum in Vienna on 19 June 2007 where it was presented as a work by an imitator of Raphael. From there, the painting joined the Ellermann private collection which sold it to the Städel Museum in 2010. 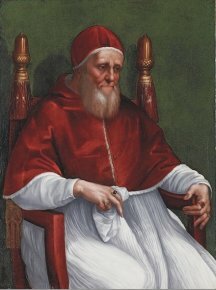 Before 1905, the work could very well correspond to the portrait of Julius II which was for sale in Paris on 29 March 1826, considered to be a good copy after Raphael according to Johann David Passavant who stated that it came from the Altamira collection in Spain, in turn inherited from the Moncada family, viceroys in Naples in the early 16th century and related to the della Rovere family there. 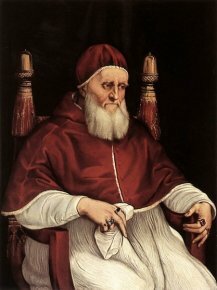 Giuliano della Rovere was elected Pope in 1503, when he took on the name of Julius II and his portrait can be precisely dated since we know he wore a beard in the winter of 1511-1512. The model is presented in a three-quarter view in a very natural pose, of actual size, seated in an armchair with the centring of the composition cut off at the knees and a focus on the hands which makes them almost more expressive than the thoughtful likeness, following an innovative formula adopted by succeeding generations of artists, such as Sebastiano del Piombo (Portraits of Clement VII), Titian (Portrait of Paul III) down on to Velázquez (Portrait of Innocent X). The scientific analyses of the painting picked up certain differences as compared to the versions in London and Florence, notably in the drawing underneath which is very spontaneous, done with a brush and which reveals changes in the position of the armchair, face, notably the nose and mouth, as well as the right hand which was first raised as if to give a blessing similar to the gesture of Gregory IX in the frescoes of the Room of the Segnatura at the Vatican (1511). The very precise and realistic treatment of Jules II’s hands and face, is in sharp contrast with the more simplified work on the clothing and background. The painting has been cleaned, the varnish lightened, the repainted areas eliminated, the missing spots filled in. An upcoming exhibition will offer a comparison between this work and the more familiar versions in London and Florence, with the title of : "Raphael and the portrait of Julius II : The artistic propaganda of a Renaissance Pope" from November 2012 to February 2013, thus allowing us to determine which of the three best deserves Vasari’s description in his Lives : "[Raphael] has produced a portrait of Pope Julius which is so accomplished and realistic, that the portrait has caused everyone who saw it to tremble as if the man himself were alive."